Service Counters help employees provide the best customer service they can possibly provide to their customers. The 48" Service Counter from Store Supply Warehouse offers business owners with a multifunctional counter which adds a sleek look to any retail store. Featuring practical adjustable rear storage shelf that can be used to house supplies or bags, employees can efficiently and quickly help customers. Our 34" high counter top surface complies with ADA guidelines. 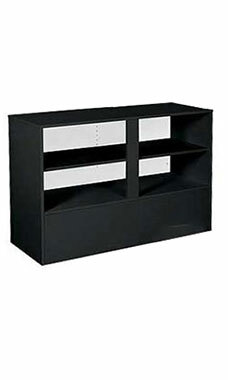 Additionally, the counter features sturdy 3/4" top, sides, shelves and front lower panel, finished in black melamine laminate finish to match our other display units. Crating for secure shipping is included in the price of the case. Overall size measures 34" x 18" x 48". Service Counters are fully assembled and ready to ship.